Now come the well meaning platitudes. She’s in a better place. Life goes on. Phrases intended to offer comfort and counsel: yes, it’s very sad but it’s time to get on with life. Through the threshold, done and dusted, as they say in Ireland. Phrases that reflect our discomfort with the death threshold and totally miss the opportunity to explore and experience the mysteries of that liminal landscape. She’s in a better place. In fact Annalu is now in a place where she is free from the pain and suffering of many months. Is it a better place? The Irish, especially our Irish ancestors, would say it is. 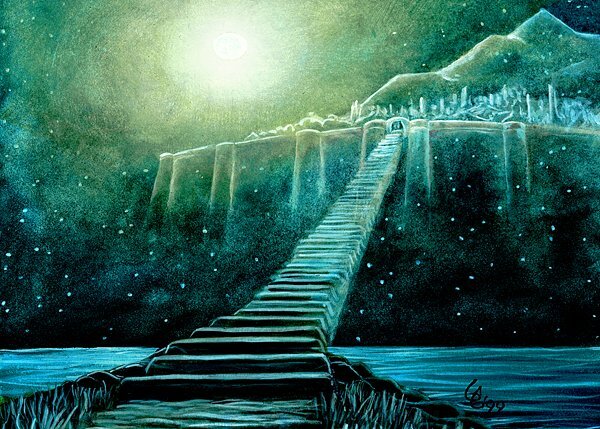 The heritage of the Irish wake is celebrating the return to the Otherworld, Tír na nÓg, a supernatural realm of everlasting youth, beauty, health, abundance and joy. In Irish mythology and history it is an island in the west. Is it a better place? Recently two dear friends, including Annalu, spoke with a psychic and in those sessions both of their beloved dead husbands expressed tremendous enthusiasm for the beauty and grandeur of the world beyond the veil. A world that is very near, as close to us as we are to ourselves. A world we can touch if we are open to it. Life goes on. Well, of course it does. But our souls never die so life goes on for all of us. When we usher someone across that threshold and close the door we shut down the opportunity to continue a relationship with those in other realms. We miss the opportunity to touch the mystery of liminal landscapes and eternal connections. People continue to ask how I am doing. And they seem surprised that I’m not walking around with pockets full of tissues. Perhaps that will come. Perhaps not. But right now I am dancing in the liminal landscape and opening to a new weaving of souls, mine and my Anam Cara’s. And in this there is such grace and peace and joy. How am I doing? Well, let’s talk about thresholds!! !